During our move to Maryland in 2009 our gas smoker was damaged. At the time, we chose not to replace it. We still have not found a good enough reason (yea, really good food is actually not good enough) to budget that replacement. But I miss smoked meat so much!! So last night I decided to put my thinking cap on to create a smoker out of our very cheap Weber kettle grill. I can’t believe how well it turned out!!! First, I used our charcoal chimney to start a small amount of briquettes. I really like this product and I don’t know why it so long for them to invent it. While those were starting I soaked apple wood chips for at least 30 minutes. We found apple to be the flavor of smoke that we enjoy the most. You will want to drain the water off of the wood chips because too much moisture will retard the actual smoke. When the briquettes are ready (they will be grayish white), I dump them into the bottom of the grill, level them flat, and dump more fresh on top. I drain the wood chips, place them inan old 9×13 pan. This gets set right on the briquettes (which is why the briquettes needed to be level). Notice the grill gets set on the pan. Last night the grill did not end up resting on the little bracket but rested right on the pan of wet chips. 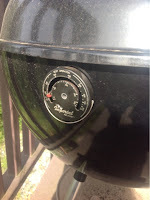 To keep track of the temp of the grill I used the magnetic temperature gauge for our wood burning stove. These are wonderful!! I Kept the heat right about 300*. You cans age the heat by the air intake on the underside of the grill. Close it to bring the heat down, open it to bring he heat up. I kept it about 75% open. Then the marinated pork loin went right on the grill. We always use a meat thermometer to keep the meat from over cooking. We pull the meat off at the internal temp of 145* (this is a safe temp for pork loin). Wrap the meat in foil to let rest for ten minutes. It will continue to cook while it rests to about 155*. Smart thinking!Charlie has taken to soaking wood chips and putting them on the lower rack of our grill, then doing the cooking on the upper rack. Amazing the difference in taste that bit of wood gives! It did give a nice smokey flavor and that lovely darkness on the outside of the meat. Oh yes!!! You are a genius! Now, feed me!